Just when we thought we’d seen it all, Anna Wintour, American Vogue‘s editor-in-chief, goes and puts Kanye West and Kim Kardashian on the cover of the magazine’s April issue. Many fashionistas are in an uproar over the unveiling of the cover, claiming that the magazine has lost it’s dignity by putting two of the most famous faces in entertainment on display, while others are calling it a marketing masterpiece. Despite the negativity that typically follows West and Kardashian, they are two of the most recognizable people in the world right now so our question is: did Anna place them on the cover for their social relevance or for marketing purposes? Wintour broke barriers in 1989 when Madonna appeared on the cover of Vogue, with many deeming the bold move “controversial”. It wasn’t long until some of the most famous faces of the 90s followed suit – Winona Ryder, Julia Roberts, Demi Moore, Oprah Winfrey, and even Hillary Clinton were gracing the seemingly unattainable cover. More recently, of course, we’ve seen the likes of Lena Dunham and Jennifer Lawrence on newsstands across the country but all of the aforementioned women were either actresses or social ‘gamechangers’, if you will. 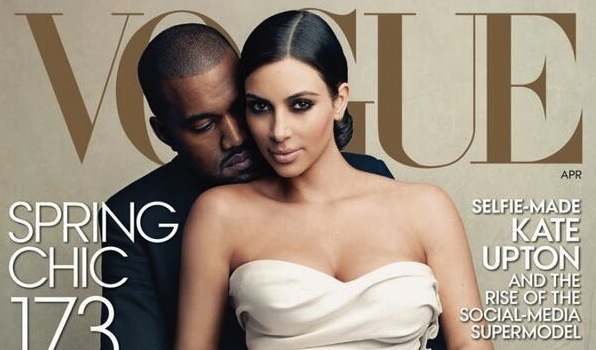 What makes Kim and Kanye worthy enough to grace Vogue? An overly-opinionated rapper and a reality TV star aren’t exactly the cookie cutter image that the magazine typically promotes, begging the question as to why they were given the cover at all. The statement may hush bloggers and fans for a brief amount of time but once the issue hits stands, the backlash is sure to come back in a major way. Many people have been expressing their utter disappointment in Wintour’s decision, calling for her to step down as editor and, as harsh as that may seem, the public opinion being negative may ultimately affect the sales for the magazine… something that was surely not anticipated by the staff at Vogue. For what is truly a dying field, print issues are highly driven by the reaction of consumers; editors need to juggle the ideas of what will sell in print so that people will continue to purchase a hard copy rather than just perusing articles online. With celebrities like Sarah Michelle Gellar (above) speaking out against the magazine, it’s hard to believe that the issue will sell with impressive numbers. From a consumer point of view, every tabloid on stands right now more likely than not features a photo of a Kardashian, so throwing Vogue into the mix will likely just blend right in with the rest of what’s out there. At the end of the day, no matter how hard they try, it’s very hard for two celebrities to make the transition from gossip articles to respected “high-fashion couple” in the blink of an eye.